AAPL stock closed up 7.21 percent by the end of trading on Monday, breaking a recent slump that saw share values drop down to a six-month low of $527.28 last week. While still far from the mid-September high of $705.07, Apple stock gained over $38 to close at $565.73, up 7.21 percent from the day's start. The rise brings an end to nearly eight weeks of losses as skittish investors began dumping shares after value peaked two months ago. Analysts have speculated that AAPL's precipitous fall can be blamed on hedge fund and individual investors' worries of an anticipated U.S. capital gains tax rate hike expected to hit in 2013. While a raise in tax liability may be a factor, a more likely scenario is the compounding of multiple variables such as Apple's new product introductions and the company's fiscal fourth quarter miss. Despite a 58 percent rise in iPhone sales year-over-year, which beat the Street's expectations, iPad sales were seen as soft at over 14 million units. Analysts expect those numbers to pick up as consumers were assumedly as waiting for the new iPad mini to debut, shipments of which are thought to be much higher than anticipated. Apple itself announced that over three million iPad minis and fourth generation iPad models were sold over the devices' first weekend of sales. 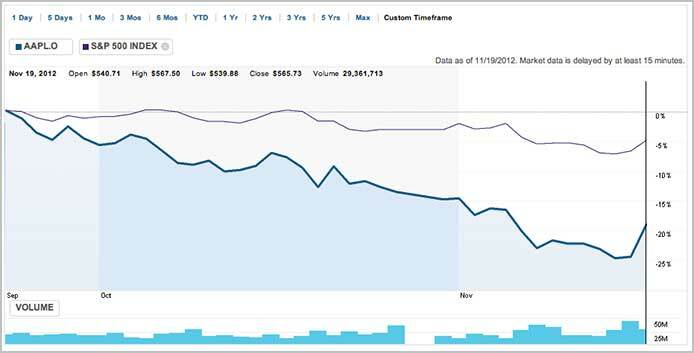 As of Monday, AAPL's market capitalization is at $532 billion, down from the almost $660 billion high in September.